What do you do when you need any help or guides? Most probably take out your phone and search it on google or any other search engine. What if I say you can earn money while searching anything online? 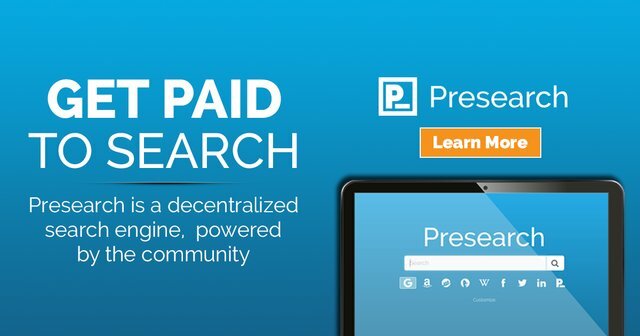 Presearch is a decentralised search engine. With presearch you can choose to view search results with many search engines and other sites like Google, Duckduckgo, etherscan, coinmarketcap etc. It fulfis all your need of seaech engine. And at the same time earn some money for you as well. 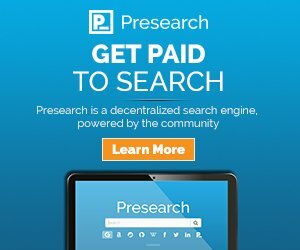 You actually earn PRE tokens while searching with presearch. You get 0.25 pre tokens for each search and you can earn max 8 PRE tokens a day. At the time of writing this article the price of PRE is 0.09$ . But remember you are getting paid for actually doing nothing. Get strated today and start earning now. Make presearch your homepage and don't forget to claim your 8 tokens daily. Wow, nice project, going to give google a run.